Providing the few aforementioned odd patches/edits are resolved in later updates, Hollywood Orchestral Woodwinds comes highly recommended. Huge range of excellent sounds. Legato lines work well. Few odd editing decisions on some patches. The third instalment in EastWest's Hollywood Series adheres to the same core concept as its Strings and Brass siblings: maximum detail and control. "As before, Shawn Murphy handled the recording, with Doug Rogers, Nick Phoenix and Thomas Bergersen on production duties"
As before, Shawn Murphy handled the recording, with Doug Rogers, Nick Phoenix and Thomas Bergersen on production duties. Following a legal dispute, some of this information is missing from the packaging, although we understand that it's due to be reinstated imminently. The full Diamond Edition (€951) comes on an internal hard drive (142GB of data), is authorised on iLok (not included), and loads into EW's PLAY instrument (standalone and VST/AU/RTAS plug-in). There's also the DVD-based Gold Edition (€570) that includes all of the articulations but is 16-bit, rather than 24-bit, and has only the Mid mic position. Editable parameters and effects include an AHDSR amplitude envelope, Stereo Doubler and Convolution Reverb. The screen is dominated by the articulations list and mic faders - up to four concurrent mic positions can be loaded (Close, Mid, Main and Surround), with a fifth Vintage option available to the surround position. You get 13 instruments, including five types of flute, four types of clarinet, two bassoons, plus oboe and English horn (cor anglais). 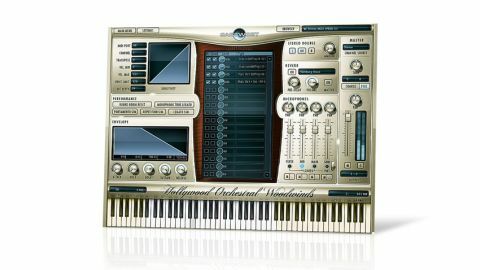 "One of HOW's best features is monophonic true legato, which makes realistic, flowing legato lines very easy to play"
Instruments are grouped by articulation into long, short, legato and effects categories, and, usefully, keyswitch patches are included (also added to Hollywood Brass in the latest update). Typically, the mod wheel acts as an expression control, and note velocity is inactive. One of HOW's best features is monophonic true legato, which makes realistic, flowing legato lines very easy to play. Realism is also improved with round robin patches and three 'artificial' scripts (Portamento, Repetition and Legato). The vast majority of the sounds are excellent, although we did notice some odd round robins on the piccolos. There also seems to be some very tight end editing on runs (clarinet, piccolo and flute) and some over-prominent release stages in the bass flute. We'd expect these to be resolved in future updates.